Bulk bags are industrial fabric containers used to store and transport dry, flowable materials. Examples include: plastic granules, grain, fertilizer and sand. 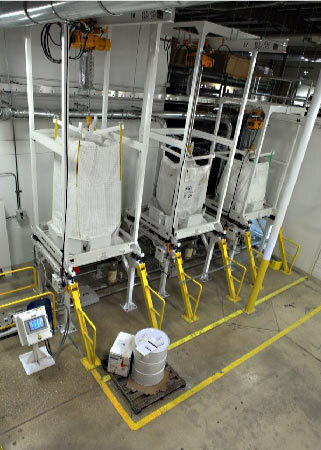 Bulk bag handling is an important part of many applications, including some pneumatic conveying projects. Bulk bag equipment can be found in a wide range of facilities, including: greenhouses, commercial agriculture facilities, commercial food distribution facilities, pharmaceutical production centers, manufacturing facilities and more. There are a few different types of bulk bag equipment, including bulk bag fillers, bulk bag unloaders and bulk bag conditioners. 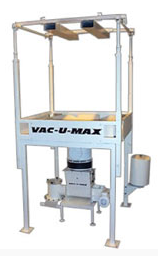 Bulk bag fillers are machines designed to fill and weigh your bulk bags. To encourage material compaction, manufacturers can equip your filling systems with vibratory bases. They can also install automatic bag removers for efficient flow, pallet dispensers and conveyors. Bulk bag unloaders, also known as bulk bag dischargers, are used to send material from the bulk bag onto its next location. When used in conjunction pneumatic conveyors, bulk bag unloaders used to unload bulk material onto the conveyor. Usually, they discharge their load via a gate, rotary valve or screw feeder. Manufacturers may equip them with any number of useful features, such as: bag agitators, which loosen material, iris valves, hoists, trolleys, dust containment outlets, bag tying and untying mechanisms and more. Bulk bag conditioners are used to break up any bulk material that has become too compact during transport. Basically, they squeeze the material. They are popular because they are easy to use, they work quickly and they require little energy output. For your convenience, bulk bag equipment manufacturers can customize your bulk bag equipment to work seamlessly with your pneumatic conveying system. Among other things, they can adjust the amount of weight the systems can bear and hoist; they can alter the heights they can hoist and they can adjust the amount of material they can load and unload. To learn more about bulk bag handling equipment, reach out to one of many pneumatic conveying and bulk handling manufacturers we have listed on this page. Air Conveyors Bulk bag equipment is a type of process equipment used to hold and transport bulk bags.